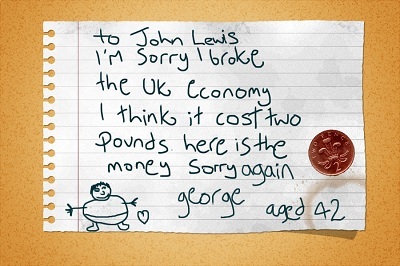 Department store John Lewis has made contact with the parents of a forty two-year-old man who had written a letter of apology after he broke the UK economy. The man, who signed his name simply as George, inexplicably sent the letter to the John Lewis store in Cambridge after he accidentally broke the economy while serving as Chancellor of the Exchequer. John Lewis later confirmed that, after a social media campaign, the man’s parents had been in touch but they didn’t really want to be associated with him in the press. Store manager Dominic Joyce had said “The letter arrived on Tuesday afternoon and had no return address or indication of who the man was. We really want to find out who he is so we can ask him what on earth he is doing. Also he said that he had attached two pounds but when it arrived there was only a two pence piece attached. We don’t believe for one second that the Post Office are to blame for this.”. George’s parents have indicated that they will attempt to explain a basic outline of how an economy works to him, but are not holding out much hope.